One of the biggest and recurrent mistakes I continually seeing job seekers of all levels and occupations making is not fully grasping the idea that they are marketing themselves, and with marketing there has to be a very clearly defined target audience to whom you are trying to appeal. This isn’t necessarily about understanding the type of company, their culture and trying to appeal to that, though some people overlook that aspect as well. Those are the types of job seekers who throw a pile of generic resumes out into cyberspace and hope that something just sticks, or someone happens to notice them in passing. That is the worst job search tactic, and probably one of the most highly utilized. But I’m not here to talk about laziness, I’m here to discuss overconfidence. I'm Getting to This... Trust Me. You might have one perfect company whom you would love to work for as a graphic designer. You’ve followed them on Twitter, Facebook, LinkedIN and a plethora of other social & professional networks. You comment regularly on the company’s blog, and follow any and all mentions they get on Mashable, AdAge and wherever else their most recent innovative work has been lauded. You have alerts set up to receive emails the second a job posting goes live. And that’s great – many companies would love to have an employee like you come in their door to interview, because you clearly have passion around the brand, and perhaps the brands they represent. You understand their company culture and would be a great fit. Unfortunately they will never interview you because your resume never gets past the HR Coordinator who doesn’t really care about Graphic Designers, because she also has to recruit an Accounts Payable Coordinator, a Marketing Manager, a CTO and database guy/person/gal. She doesn’t want to see the world’s greatest portfolio or cheeky online profile… she wants to see a traditional resume that tells her what you do/did and when. The point? She doesn’t specialize in your field, and unless you spell it out for her, it doesn’t matter how good your are, how passionate you are, or that your apartment is Pantone-matched to the company’s branding. HR people aren’t idiots (not always, anyway) – that is certainly not what I am saying. Conversely, they are the first line of defense in attaining and retaining the best talent in the industry for their organization, which ultimately leads to new business, new revenue, and continued success. THAT is their priority – not deciphering your website, your profile or your resume. I’m not putting down creativity, and plenty of times it has gotten people stellar jobs. But creative shop or not, sometimes you still just have to deal with HR, and that’s the bottom line. Let me explain. I see this quite often with more experienced creative folks, where many are very accomplished professionals and their websites are dripping with recommendations and testimonials. And this often leads candidates to nix the importance of a regular ol’ resume and rely on their portfolios or their work to “tell their story”, to convey just how good they are and what accomplishments and experience they’ve racked up to change the face of advertising as we know it. The Creative Director/CEO/Managing Director/Director-of-Whatever is rarely ever the first person to look at your resume. I know this because I have been both a third-party recruiter, and an in-house recruiter, and my job existed because the people with the hiring power don’t have time to review piles of resumes. They base their hiring decisions on the recommendations of people like me – third-party recruiters, their internal HR staff, and sometimes even their assistant or protege. Right there, there is likely 2, maybe even 3 channels that your resume has to get through first before it’s even recommended to the Decision Maker to look at, and so your marketing message has to be really really strong. Ever played the game of Telephone when you were a kid? Play it again this weekend – and you’ll understand how easy it is for the message to get watered down after 2 or 3 different parties carry it over to the next. The Company: You clearly brand yourself as someone who appreciates, understands, and fits in with the company’s culture, mission, and client-base. The HR Rep or Recruiter: Your resume clearly brands you as someone qualified for the role by using the right keywords, illustrating relevant experience, showing growth potential, and differentiating yourself from other candidates with similar backgrounds through your relevant accomplishments. The Decision Maker: You’ve appealed to the other two, and now you’re fully confident in explaining why they are making a solid investment in hiring you, and what you are bringing to the table for the team, the company and their client base. Don’t jump the gun and bypass the first two in hopes of appealing right to the decision maker with your glorious tales of triumph and battle kills – it doesn’t work like that. Nor does being overly creative and cheeky. Case in point – I had a girl once send me a graphic design resume with her qualifications written in sharpie pen on her bare back and buttocks. Get my attention? Yes. 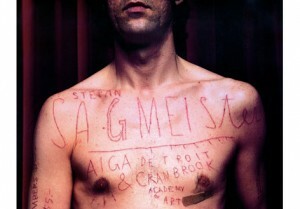 But unfortunately I didn’t get the clever Stefan Sagmeister reference and chalked her up to simply being out of her mind. An amazing self-promotional package geared toward the higher-ups sometimes isn’t the right approach. If Johnny HR doesn’t specialize in your industry, and he hires for a bunch of different types of roles, he won’t get your message, and he won’t be impressed. Spell it out – never assume anyone will read between the lines, or speak your industry speak. And finally? Never underestimate the importance of that individual in HR, the poor shmuck everyone is so quick to criticize, belittle and blame. The funny thing is, 95% of the time, they will be the ones deciding your fate, and if your resume ever makes it out of the inbox. And truth be told, you can’t bow before the king if you never make it past the guard. Let’s Blog for Happy and Healthy Young Women! 1 Comment on "Understanding Your Target Audience: Why ‘Perfect’ Candidates Don’t Get Called Back"
This is GREAT insight and advice. Thank you so much!